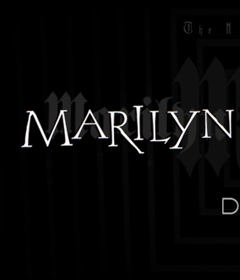 A brand new NACHTKABARETT Update for 2010/2011 focusing on the areas of the site which always should have been first and foremost : The Complete Marilyn Manson Archives. GOLDEN AGE OF GROTESQUE ERA MARILYNMANSON.COM | MarilynManson.com was very complimental to the themes and imagery which influence the album throughout this era. Though The Golden Age of Grotesque gave birth to no hidden "sister" sites it did however intricately chronicle Manson's transformation into the debauched, absinthe-infused Weimar era "Arch Dandy" artíste whom he evolved into on the album and during the Grotesk Burlesk. Contained within are the various imageries and intricacies of the site between 2002 to 2004 which paralleled the time period to the creativity and artistic reckless abandon of 1930's Weimar Germany that Manson sought out to recapture with the album and era. 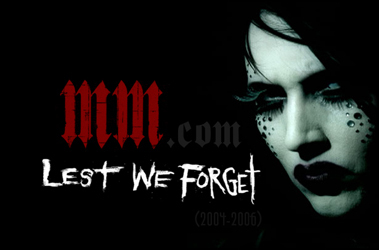 LEST WE FORGET ERA MARILYNMANSON.COM | After a 3-day "coming soon" screen MarilynManson.com is updated on September 26, 2004 with a new skin and imagery corresponding to Lest We Forget's material and the subsequent tour. The new site, adorned with Manson's face from Personal Jesus, has a very active news section as its main page, to which the flash introductions archived in the article below were redirecting to until January 2006, a presentation of the band's discography, a gallery of photos from Personal Jesus, the Against All Gods tour dates, and a re-cut version of Manson's Journal. 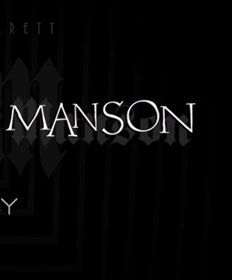 The art and merch sites also underwent signicant changes to adopt Manson's new imagery. Also features an official Lest We Forget mini-site which surfaced September 9th, 2004. MARILYN MANSON / CELEBRITARIAN CORPORATION LOGO | Though evidently aborted for use upon the release of 'Eat Me, Drink Me' in 2007, this logo which never rose to full fruition was the central piece to the montage that was the official Celebritarian Corporation masthead which Manson conceptualized to embody the era and art movement he had been cultivating between 2004 to 2006. Outlined in the following is a breakdown of each element of the collage with all that can be inferred about it and the logo with its minimal use and release, which were all amalgamated and assembled together to embody the ethos of Celebritarianism, with each piece a representation of the themes Manson wished to portray.